Andrew Carnegie (25 November 1835 – 11 August 1919) was a Scottish-American businessman. He ran U.S. Steel, a major steel making corporation. When he retired, he was one of the richest men in America. He used his large amounts of money to fund charities. These charities gave money to universities he had a hall built for him ( called Carnegie Hall), and built public libraries(called Carnegie Libraries). Andrew Carnegie was very charitable in the will he created through the State of New York. In his will, he gave monetary gifts to several funds, institutions, societies, and to Pittsburgh University. He also gave gifts to his employees and family. 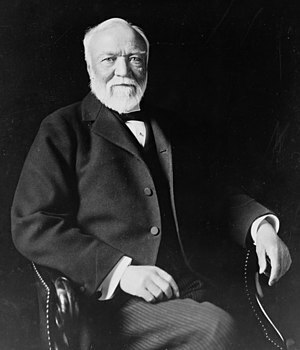 Carnegie had given away nearly $350,000 on charities, pensions, schools, libraries, and museums. Carnegie had given all of that amount of money because after a disaster happened outside his company people thought he was a bad person. He thought by giving away all that money people would think he was good. ↑ 1.0 1.1 1.2 "Andrew Carnegie dies of pneumonia in his 84th year". New York Times. 12 August 1919. http://query.nytimes.com/mem/archive-free/pdf?res=9A05E2DA1338EE32A25751C1A96E9C946896D6CF. Retrieved 21 April 2013. This page was last changed on 18 April 2014, at 00:10.